Finding real haunted house video footage isn't easy. It often takes a discerning eye to spot a fake; real ghost videos are rare, but when you see one, it may convince you that ghosts are real. Check out video evidence from haunted homes and see what you think. In this Today Show clip, Lilliana Vasquez visits the Merchant's House Museum in New York City with a camera crew to join the Ghost Brothers on an investigation. In the clip, Vasquez sees what she believes are ghostly images on a piece of paranormal equipment called an SLS camera and hears a response to a question on a ghost box. Located in Old Town San Diego, the Whaley House is one of Southern California's most notorious haunts. In this video, Family First Paranormal experiences poltergeist activity at the well-known haunt. According to Michael D. Magee on YouTube, he has been haunted since 2010. In the video, you'll see a lot of orbs floating about. Ignore those; they are most likely dust. Then, you'll see poltergeist-like activity. It's impossible to tell whether it's authentic, but the channel owner claims it is. Keith Linder lived in a house in Bothell, Washington for four years before moving out in 2016. During his time in what he came to call "the Bothell Hell House" (also the name of his book about his experience), Linder documented poltergeist style activity including books and posters spontaneously bursting into flames. Linder felt the activity was demonic. His claims drew the interest of the show Ghost Adventures, which visited and found nothing to support the reported activity. The reports drew the interest of other paranormal investigators as well, including Steve Mera and Don Philips from the UK. The video below shows some of their experiences in the house. The small house in Villisca, Iowa was once home to the Moore family. In 1912, the entire family was bludgeoned to death, and now the house is notoriously haunted. Here, LiveScifi documents some history of the house, people's stories of their experiences, and footage from things they experienced in the house. 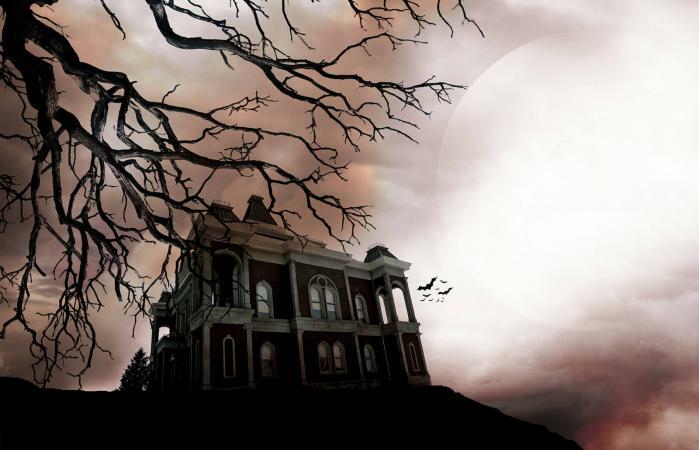 Lemp Mansion in St. Louis is famously haunted. In this video, a paranormal investigation team notes various possible paranormal activity over the course of a night including moving objects, light anomalies, disembodied voices, and sensors that randomly go off. The Walker-Ames house is an abandoned haunted house in the town of Port Gamble, Washington. It's a favorite place for paranormal teams to investigate, and the attic and basement are two of the house's hotspots. In this video, a paranormal group captures a whispered voice in the basement. With all the haunted house and ghost videos posted online, where can you find authentic paranormal footage? Start by looking for video clips from television shows on ghost hunting and the paranormal. Investigators on these shows claim their footage is real, and they use technical equipment to capture evidence. They also appear to be careful to try to disprove anomalies that may have a natural explanation. The goal of these teams is to discover the truth about a haunted location and to document the phenomenon if it exists. Ghost Hunters was a weekly show that appears on the SyFy channel. It was one of the first ghost hunting television shows to air and can be credited for creating such widespread interest in paranormal phenomenon. Ghost Hunters claims their videos are authentic. Check out the SyFy website for clips of videos from The Atlantic Paranormal Research Society (TAPS). Ghost Adventures airs each week on the Travel Channel, and the show offers evidence of their haunted adventures. While many in the paranormal field doubt the veracity of their paranormal footage, others feel it is legitimate, so you'll need to watch and decide for yourself. You can see clips from the show on the Travel Channel's website or watch full episodes (possibly for a fee) on Hulu. You can watch reenactments of true haunting cases on shows like Paranormal Witness on SyFy. However, if you want to see possibly real videos of haunted houses and other locations, you might find them on the Biography Channel's My Ghost Story. The show chronicles ordinary people who have caught paranormal evidence in their own homes or at haunted locations they happen to visit. The videos and photos featured on this show are sometimes even more compelling than the evidence captured by investigators. You can watch full episodes for a fee on Amazon. Sometimes people catch anomalies entirely by accident. Home renovations can increase paranormal activity in haunted homes, starting spiritual activity in homes that were previously inactive. In one instance, contractors who suspected the home was being vandalized set up surveillance cameras, and what they caught surprised everybody. Other people seem to attract spirits naturally because they can see, feel, or hear them. Linda Davis claims to have attracted spirits her entire life. As she stands in the basement of an abandoned home, you can see orbs appearing all around her. Ultimately, it will be up to you to decide whether the footage you're looking at is paranormal, faked, or just misidentified. It can be difficult to discern whether the anomalies caught on video are truly paranormal or if the video has somehow been tampered with or hoaxed. Sometimes it comes down to the credibility of those who take the footage. Therefore, you may want to try visiting a few haunted locations yourself to see if you can capture anything unusual. It also helps to have a basic understanding of photography to help rule out artifacts created by the equipment or the lighting.